I feel like the person in the alt text most of the time, and it's absolutely not the fault of the people don't understand this thing. I'm not going to claim this "uses a beautiful distributed graph theory tree model (it doesn't), or "pretty simple" (it's not); instead, I'm going to present the git tutorial I wish someone else would've showed me. One final note: there is more than one way to do most things in git. I am opting for the most cohesive and that which I find to apply to most scenarios. One thing we are going to do is memorize a few shell commands. My first Java tutorial showed all of the boilerplate - the class, the public static void main(String args), and asked the reader to take it on faith that this would all make sense later. So I'm going to do that here, just this once. The second is an undo proper: after a git operation has completed, to back it out, you run the obtuse long thing. Note that git reset itself counts as an operation, so to redo, one effectively just undoes again. Git does keep a state log much farther into the past, so it is possible to undo more than one operation, but I need to explain some other things before we get there. Note that one can git init . in a directory that is not empty, and git will not touch the existing files. In fact, git tries to be as apathetic about the world around it as possible; you can even move the repository around, or rename it, and git won't care (it won't even notice). That's all fine and good, but most of the time we don't work with repositories created in this way. Most of the time, "someone else" made the repository - whether that person is another person running git init for their codebase, or a piece of software (e.g., GitHub) running per user request. Receiving objects: 100% (277/277), 2.12 MiB | 3.14 MiB/s, done. And it's all there. Be careful - there will have been new commits since this writing, and not all outputs will match exactly. In the above example, there are two entries whose names start with a dot, and so are invisible in normal ls. The first is the ".git" directory. This contains internal git state - everything git knows about the repository. It's very interesting to look at what's in there, if you're me and are interested in the inner workings of version control. Otherwise I don't recommend it. There's a lot going on in the output of that command, so let's go through some of it (and we'll do more in a bit). First, we edit the contents of, in order, an ignored file, an untracked file, and a tracked file. Then, when we ask git about the state of the world (git status), it tells us nothing about the first file (because it's ignored), that an untracked file exists (because we just made it), and that a file has changed (modified). Note that it only undid the changes to the file(s) that git tracked - the untracked file and the ignored file are left alone. Git organizes commits into branches. Branches are just readable pointers for the hashes, and can be moved to point to a different hash. (This will make sense in a moment.) The default branch is named master, so that is the branch we are on now, as git status informed us. More formally, HEAD is pointed at the tip of the master branch, where HEAD is a pointer at to the hash which reflects the repository state. git checkout is a command which manipulates both HEAD and the repository contents simultaneously. In this case, we have asked it to create a new branch, called "new file", which points to the same hash as HEAD (which, one will recall, is at the tip of master). And once it's done that, git checkout will switch HEAD to point to it and update repository contents to match. Since they point to the same hash, no changes are actually made to the repository contents. However, if we were switching to an existing branch (call git checkout new_file instead), it is possible that there would have been changes to repository contents. A brief note on commit messages: the git tooling - and most projects - expects your commit messages to consist of a single, <50 character message. This can be followed by a <~78 character-wrapped paragraph separated by a blank line. There can also be colon-delimted tags (think HTTP headers, if you're familiar). Commit message styling is something people care a lot about. So, for each commit, it shows the hash, the message, (a few other things,) and then the first parent is just the next one in the list. Git purists will say that pull request procedure is not part of git proper. To which I say that, while perhaps true, it does the reader a disservice to ignore it. Since this is the direction most tools are heading, and because this is how I handle the victim example repository, I assume something that works like GitHub. From there, it's back into the web interface to make a PR from our fork's branch. Suppose you were me, received this pull request, and decided to add it to the repository. Depending on how the project works, I would do one of two things, which I will call the merge workflow and the rebase workflow. Most web tools, GitHub included, favor the merge workflow by providing a button to do it for you. Supposing I wanted to do this myself, though, I would first fetch your fork (add remote first), and then generate a merge commit. A merge commit is a special kind of commit that is identical to a normal commit except that it has multiple parent commits. The easiest way to generate a merge commit is to run git merge my_fork/new_file, where my_fork is the remote and new_file is the branch, which will create a commit uniting the new_file branch from the fork onto the current branch. A merge commit typically merges a smaller, development branch onto a main branch. Many people do not like merge commits because having multiple parents creates a nonlinear history, which is more difficult to work with later. This contrasts with the rebase workflow, which is harder to execute but results in a cleaner repository history. Here, confusingly, one also runs git merge, but does it slightly differently: git merge --ff-only my_fork/new_file. If it all works, then the current branch looks as if the commits in new_file had happened on top of it originally. That is, no merge commit is generated. I'll get into what happens for failure in both workflows in just a moment. As an example of this in the wild: the Linux kernel uses the rebase workflow (without a web tool) for each subsystem, and then the subsystem maintainers periodically ask Linus to pull their subsystem into the mainline kernel branch using merge workflow. git merge, in the merge workflow, will prompt the operator (that's us) to fix the conflict: git status reveals what is wrong, and git sets off the problematic regions of the file with "<<<" and ">>>". git add the files once fixed, and then commit when done. The rebase workflow is so named because of the way these conflicts are resolved. Typically the problem of failure here is given back to the contributor of the pull request, which I think is bad, but since it's common I need to explain it. Hey look, a wild new command appeared! git pull is just a handy shortcut: it runs git fetch followed by git merge --ff (which will not generate a merge commit unless there is a conflict one needs to resolve). The final invocation in that block performs what we call an interactive rebase. It will open an editor displaying the actions to be performed. Here, we're just using it as a sanity check: it should show only commits from the fork's branch, but sometimes it gets confused. git rebase is a very powerful history editing tool, and I'm not going to be able to explain it all here. 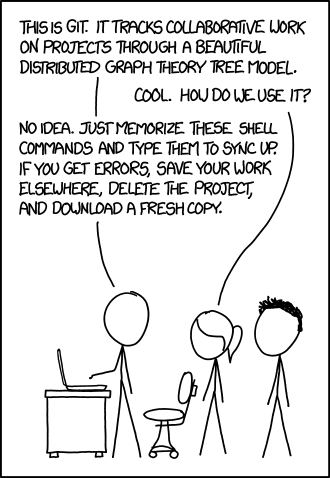 Many people prefer not to work with it at all, and history editing is actively discouraged in other version control systems (e.g., mercurial). Git has many different ways to delimit commits and commit ranges. If I've written this well, you should be able to now read most of man gitrevisions. Git has its own idiosyncratic documentation style that it's worth getting used to eventually. In particular, I recommend understanding "~", "^", and ".."; one may also find use for "..." on occasion. It is also important to be aware of which commands use "remote/branch" and which use "remote branch". More on this at the end. Occasionally, one may wish to apply a specific commit from another branch onto the current branch. Supposedly there was debate about including this functionality into git at all (though one can beat on the tool to do pretty much anything, especially with git rebase), but I have found it very useful in managing release branches. A release branch is a branch which is expected to be slower-moving than master; generally, it only receives new commits for bugfixes, and eventually it stops being supported. Typically, these bugfixes will land in the master branch first, and then the stable branch maintainer will apply them. The invocation is git cherry-pick -x commithash (where commithash is of course the hash of the target commit, or a pointer to it, or a commit range). I recommend the use of "-x", which will record the commit hash we cherry-picked from in the new commit. Remember that since commits include parent information, this will not be the same hash. Certain git operations demand full control over the tree and will complain if there are changes which have not been committed. The easiest things to do are of course commit the changes or discard them, but sometimes this isn't possible. Enter git stash. Running this command creates a temporary commit with your changes. One can then perform the persnickety operation, and then run git stash pop to restore the changes. This is a very "hold my beer" kind of operation: its very common to push a stash and forget to pop it later. Since there are no commit messages logged, these are almost always incomprehensible when discovered. Incidentally, it is possible to make multiple stash commits, and they function as a stack; I do not recommend it. Historically, git has become extremely prevalent due to its speed. Its user interface is not intuitive at all; the user must be aware of its internal workings. The design did not believe in abstraction, and there are parts that were very clearly not designed as part of the whole. Please do not make software like this.